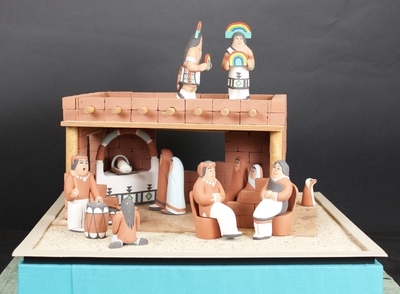 Even though artists in the New Mexico pueblos were exposed to Christianity since 1540, their contribution to Christian art has been modest and sporadic until they discovered the nativity set. The first Indian-made nativities appeared in the late 1950s with interest and production quickening over the next decades. Today, a number of Indian artisans consider nativity sets an important element of their creative endeavor. The figures speak a message of the earth--of life and life's origin. Many details of the human or animal body are not important as long as they reflect this clear message of the earth. As a result, the pueblo crèche figures may seem crude or simple. The sets include features of a culture not indebted to Christianity and the viewer needs to consider them from two different vantage points. The birth of Christ is depicted in the scene and through the traditional characters. Indian culture can be found in the decorative details, designs, and native characters. Robert Toledo has used an adobe house, drummers, and rainbow dancers to merge the indigenous culture with that of the birth of Christ. Handsculpted, painted clay figures depicting the nativity of Jesus. The set, including the adobe building, were created by artist Robert Toledo in Jemez Pueblo, New Mexico. Exhibition label originally written by Fr. Johann G. Roten, S.M. for exhibit entitled "At The Manger: No Place Like Home" held at Roesch Library, University of Dayton.